Charoite is named after the single known location in the world where it has been found – along the Chary River in Aldan, Siberia (Russia). Apparently first discovered in the 1940’s, it was not made known to the world until the 1970’s. Charoite is a hydrated silicate of very complex composition and very limited distribution, formed in limestone through a process called contact metamorphism, which means the limestone was altered into a completely different mineral when it came into contact with another substance – in this case, molten Syenite, a coarse-grained, intrusive igneous rock similar in composition to granite, but with a very low presence or complete absence of quartz. As the molten syenite intruded into the limestone, the heat and pressure that built up caused the chemicals present in both the limestone and syenite to react with each other, and they transformed into this completely new mineral known as Hydrated Potassium Sodium Calcium Barium Strontium Silicate Hydroxide Fluoride – more commonly known as Charoite. The striking result of this intrusion and transformation of minerals is a very beautiful swirling pattern of fibrous interlocking crystal masses. One can actually see the evidence with ones own eyes of how the molten syenite forced its way into the very being of the limestone and compelled it to become something else entirely. There are two other minerals often found as inclusions in chaorite. One is the black Aegrine and the other, the light orange tinakite. 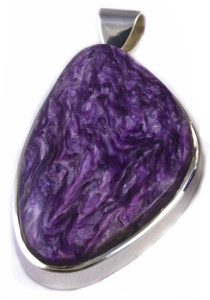 It is the potassium component of Charoite which is responsible for the mineral’s lovely rich purple colour. The way the different shades of purple, lavender and violet swirl and twist through the stone is something very distinctive to charoite. Some crystal fibres show some chatoyancy – the phenomenon of changing in colour or lustre, depending on the angle of the light. The occasional pale orange streak of tinakite or black spot of aegrine may also occur, adding contrast. Charoite is considered a stone of transformation. It cleanses the etheric body and helps one to release negativity, allowing for personal transformation and growth. It fosters a sense of acceptance and forgiveness. Charoite connects the heart and crown chakras, allowing one to ground ones spiritual self and be open in the heart. It can help us to receive the guidance we require so we can be in true service in the world. For those suffering from insomnia, nightmares or generally disturbed sleep, charoite assists in promoting deep, undisturbed sleep and helps to overcome the fears that arise in nightmares. It is said to be particularly powerful in combination with amethyst and may be placed under ones pillow for this purpose. 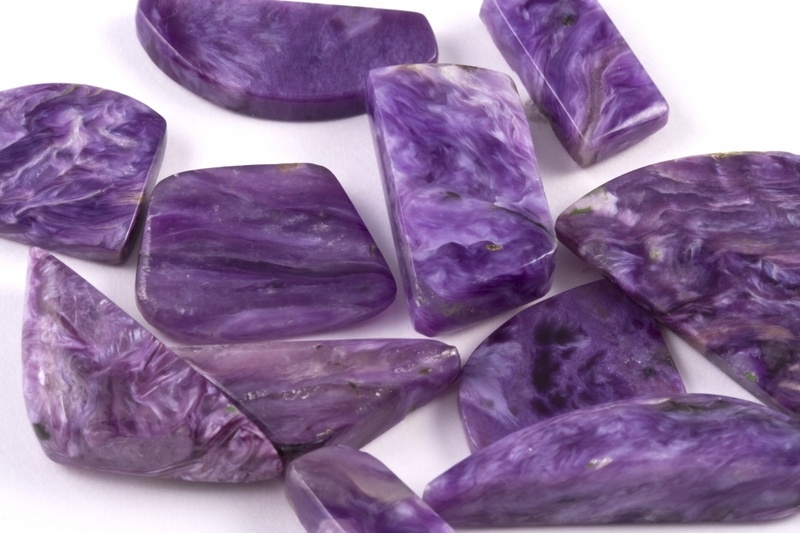 Charoite is said to help in cultivating clairvoyancy and other psychic abilities. It aids in regulating this transformation by regulating the flow of energy, so one can acclimatise to these new talents and skills whilst still being grounded. It helps us to remain committed to our spiritual journey by keeping us accountable and honest with ourselves. Additionally, it helps us to differentiate between the things that are our own personal issues and those that actually belong to other people. Charoite is also credited with promoting precision and analytical skills and a longer attention span, so may be beneficial for study or work. For healers it helps one to remain objective when analysing a patient’s situation. Charoite aligns the meridians in the upper body and helps to increase physical energy. It is said to be beneficial for regulating blood pressure and for the treatment of eye, liver, pancreas and heart ailments. It is also said to alleviete headaches and general bodily aches and pains. 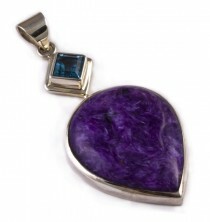 It has been suggested that wearing charoite may help to protect those in the medical industry who work closely with x ray. 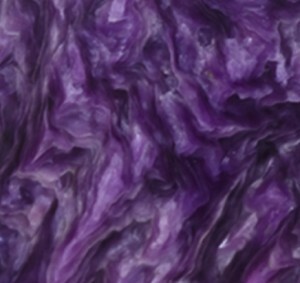 Charoite relates to the astrological signs of Sagittarius and Scorpio and vibrates to the number 7. Learn about our community care projects.